There are no climate or geographic barriers for Jerseys as they are very resilient animals and thrive in the heat of Brazil as well as the frigid winter of northern Canada. Decreased feed requirements result in less land base and fewer costs required to harvest and store feed. With the Jerseys early calving capability, it also means that you need less feed to get them to first calving than larger breeds. Mitloenher is reported as saying that the more milk a cow produces, the lower her GHG emissions. This is because she utilizes the energy in her feed for milk production, rather than expelling it as waste. Earlier calving. Once on regular feed, the energy a heifer takes in is used to produce muscle tissue, not milk. The heifer contributes to the farm’s overall GHG emissions, but she is not yet contributing to the farm’s milk production. The earlier she starts her first lactation, the less GHG emissions she produces without any milk production. On average, Jerseys reach breeding age 8 weeks sooner than Holsteins. By getting in calf sooner, she will begin her first lactation earlier. Improve longevity. “Mitloehner said the North American rate of culling mature cows in a herd raises the overall GHG emissions of a herd because of the need to be raising replacement heifers which aren’t producing milk for the first two years of their lifespan.” A recent American study found Jerseys to have the lowest culling rate of all breeds, at 25%. Jerseys stay in the herd longer, so fewer replacement heifers are needed. Read more on this from Hoards Dairyman (2014). A milking Jersey cow produces 55% less phosphorus (P2O5) in her manure than other dairy breeds. This fact is recognized by the Government of Quebec, as outlined in the Agricultural Operations Regulation Environment Quality Act (Chapter Q-2, r.26), and represents an incredible opportunity for dairy producers everywhere to efficiently administering their nutrient management program while maximizing their herd size.Farmers all across the country work diligently to maintain effective nutrient management programs. For dairy producers, this includes applying manure to cropland to ensure a continuous nutrient cycle: nutrients are transported from the field to the barn as feed, and then replaced in the field as manure. The three key nutrients in plant production are nitrogen, phosphorus, and potassium. Phosphorus is an essential element for profitable plant and animal production. Soil which contains adequate phosphorus will have improved crop quality, increased root growth, earlier crop maturity, and higher grain production. Generally though, manure application is based on meeting a crop’s nitrogen requirements, which tends to result in excess phosphorus and potassium being applied to the soil because of a mismatch between the nutrient content in manure, and the crop’s nutrient needs. Agricultural runoff is a known contributor of excess phosphorus making its way into surface waters and causing an increase in algae growth, called eutrophication. Built-up phosphorus in the top 5cm of soil is washed into surface waterways, or is carried by water percolating through the soil into ground water. Eutrophication limits light penetration in the water system, depletes dissolved organic carbon, and raises pH levels during the day. Eventually, the dense algal blooms die and decompose, depleting the water’s dissolved oxygen. Conversion tillage, crop residue management, buffer strips, riparian zones, contour tillage, cover crops and settling basins are all methods producers can use to reduce agricultural runoff and increase the soil’s resistance to erosion. Another important nutrient management technique is called source management. This is where producers minimize the buildup of phosphorus in the soil while optimizing crop growth levels. This involves adjusting the feed program on the farm to meet the cows’ dietary requirements for phosphorus while minimizing phosphorus output in manure. The nutrient content of manure from dairy cattle is affected by a number of factors, including diet, housing and bedding system, method of manure storage, and type of manure application system. The Jersey’s comparatively small body size combined with higher milk production per unit of body weight results in about 55% less phosphorus per kilogram of manure, compared to other dairy breeds. Cheese made from 100% Jersey milk results in 32% less water, 11% less land and a 20% lower carbon footprint. A study was conducted by Dr. Jude Capper of Washington State University, and Dr. Roger Cady of Elanco Animal Health, which compared the environmental impact of producing 500,000 tonnes of cheddar cheese using Jersey milk and Holstein milk. The study found that cheese made from nutrient-dense Jersey milk involves considerably less water, land, fuel, waste output and greenhouse gas emissions than cheese made from Holstein milk. Researchers used an average body weight for Holstein cows of 680kg (1,500 lbs), and 454kg (1,000 lbs) for Jersey cows. Although individual Jerseys produce a smaller volume of milk, their higher fat and protein production, combined with their smaller body mass, sets the Jersey apart when it comes to cheese production.Although 9% more individual Jersey cows were needed to produce 500,000 metric tons (tonnes) of cheddar cheese than Holsteins, the overall body mass of Jerseys was still 26% less than for their Black and White counterparts. Thanks to component-rich Jersey milk, 19% less milk volume was required for the Jersey cheese compared to the Holstein cheese. Jerseys average 0.125kg cheese/kg milk (12.5 lbs cheese/cwt), while Holsteins average 0.101kg cheese/kg milk (10.1 lbs cheese/cwt). 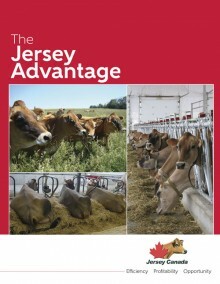 The smaller Jersey animal also requires 32% less water and 11% less land to produce 500,000 tonnes of cheddar, making their overall carbon footprint 20% smaller than that of Holsteins. Consumers looking to minimize the environmental impact of their food choices would do well to seek out 100% Jersey cheese. Capper and Cady concluded that although individual Jerseys produce a smaller volume of milk, their higher fat and protein production, combined with their smaller body mass, sets the Jersey apart when it comes to the environmental impact of cheese production.